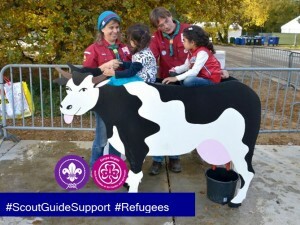 Scouts and Guides contributing to refugee support activities in their local communities in Europe (33): a story from the Scouting Regio ZON. “A refugee camp with a capacity for 3000 people has been set up near Nijmegen. This site is called Heumensoord and is the responsibility of the Central Organisation for Refugees (COA) in the Netherlands. The COA also cooperates with a local volunteer organisation called STIP. Heumensoord is in the centre of the Guiding/Scouting District of Region ZON, which has 39 guide/scout groups with approximately 1000 staff and 3300 members. As Heumensoord is located in our region, we wished to offer guide/scout programmes to the children in the camp. We estimated that the camp has about 430 children up to 12 years old and 100-200 between 13 and 18 years old. Having first contacted the COA and STIP, our team had an initial meeting on October 19 2015, to work out plans for guide/scout programmes. We then contacted the Dutch Scouting Centre to inform them about our plans and request advice about the plans’ completeness, insurance issues, contact with the press, etc. Everything then proceeded rapidly, with much work being done in only a few days, including (i) a logo and flyer (‘Who will help next Sunday?’), presented on Facebook and received 4000 responses within 2 days; (ii) communication groups for Facebook and WhatsApp; (iii) defining the programme and discussing it with the COA, particularly about the rules and the do’s and don’ts; and (iv) also having Syrian translators involved. The first Guide/Scout meeting at Heumensoord took place on Sunday October 25th! There were 26 enthusiastic Scout leaders, including 2 who had just returned from the World Jamboree in Japan. We organised many typical and traditional Dutch games. There were reporters from the local newspapers, so we received a lot of publicity. It was all a great success and experience. We were enthusiastic about this success and therefore decided to continue the programme every Sunday afternoon for the next 6 months. Subsequently, and very quickly, several great things happened: (i) a dedicated program team of 6 Scout leaders attends every week; (ii) there is much support from all members of our district: 20 staff leaders weekly ; (iii) we started fundraising, and a substantial budget was created within one week; and (iv) we made badges for the staff and for promotion (purchase your badge for € 10,- to support our programme at Heumensoord). In short, the programme is running well, with about 40-60 participants every week. We have already had several fantastic Sunday afternoons and are still going strong! What’s the programme? What do we offer? We have all types of games with the exception of computer games. All the children, young people and enthusiastic parents are welcome to attend. At first we started with general games but gradually introducing more guiding/scouting games and structure. For example, we have included guiding/scouting skills such as the use of a compass, wind directions and of course knots. The youngsters enjoy this very much so we plan to slowly increasing the skill levels each week. We also encourage the children to create their own games. Our team and our programme will be present every Sunday in December. We think this is essential, since it is not appropriate to tell the refugees “Sorry, there’s no meeting next Sunday, because for us it is holiday time.”.